If December was a chance to reflect on a 2015 two-wheeled motorsport season that featured lots of good, the odd bad and occasionally just ugly, then the turn of the year means the focus is very much on 2016 as we cross-off the days towards the start of another keenly anticipated season. A maiden podium it may have yielded, but the 2015 MotoGP season would prove an otherwise sobering experience for Scott Redding on the Marc VDS Honda as he struggled to get entirely comfortable on the RC213V. A disappointing follow-up to 2014's promising maiden campaign on the 'Open' Honda, Redding nonetheless heads into 2016 re-energised and re-motivated following a switch to Ducati machinery with the Pramac team. After glowing reports from the initial winter tests, along with the new single ECU and Michelin tyres, Redding is likely to be a man on the move if he can get the Desmosedici GP15 dialled in correctly. 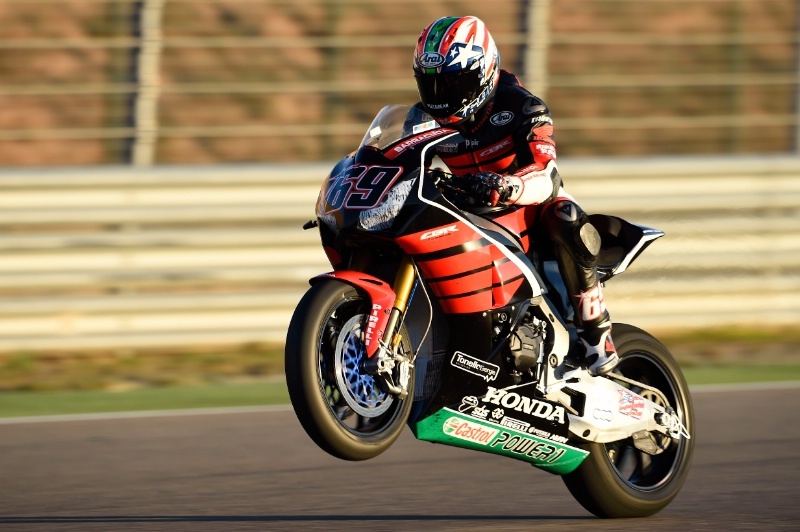 A decade on from clinching his one and only MotoGP World Championship title, Nicky Hayden will embark on a new chapter in his long career this season as he heads to the World Superbike Championship for 2016. Penning a deal to ride the Ten Kate Racing-prepared Honda CBR1000RR, though Hayden isn't the first rider to make the move from MotoGP to WSBK, he will be the first world champion to make the move and hopes are high. Getting his hands on the 'Blade for the first time in November, Hayden already said the machine is 'starting to feel like my bike', as he found a rhythm with the Superbike engine, electronics and Pirelli tyres. Considering Hayden had enjoyed a limited amount of time on the WSBK-specification Honda in Jerez, the Kentucky Kid was already showing positive comparative pace to his rivals. Though Honda hasn't mounted a convincing title challenge since 2007 and we are still a year away for the long-awaited new model, there are high hopes that he can at least return the manufacturer to winning ways after a barren 2015. The best of Britain and Germany's Superbike Championships will step up to the world stage in 2016, with Josh Brookes and Xavi Fores tipped to shine this year, but it is the belated full-time debut of Markus Reiterberger that should command your attention in 2016. Though he has made the odd wild-card appearance in recent years, Reiterberger joins the BMW-supported Althea Racing team for his first full-time crack at the world championship in 2016 alongside WSBK race winner Jordi Torres. A loyal member of the BMW fold for several years now despite being aged only 21, Reiterberger has already brought the manufacturer two IDM Superbike titles in Germany (winning 12 of the 16 races in 2015), while his affinity with the S1000RR was immediately on display in post-season testing as he emerged as the fastest non-Kawasaki rider. Undeniably fast, if prone to error, Danny Buchan endured a rollercoaster season in British Superbikes last year, but showed enough flashes on form in 2015 to earmark him as a potential dark horse for 2016 on the Lloyds British Moto Rapido Ducati. Demonstrating he has the pace to race at the sharp end of the grid during his time with the (shortlived) Be Wiser Kawasaki squad, he found added consistency when he stepped in for the injured Stuart Easton at PBM Kawasaki during the Showdown rounds. After a triumphant end to 2015 by claiming victory at the Macau Grand Prix with Briggs Equipment BMW, Hickman jumped on a plane to begin working on the new Kawasaki ZX-10R in Spain with JG Speedfit and was left beaming by the results. The Louth-based rider is JG Speedfit Kawasaki's sole challenger for the North West 200, Isle of Man TT and Ulster Grand Prix, as well as a full BSB campaign. After becoming the eighth-fastest rider ever to take on the TT course with a 131.626mph lap in only his second appearance, Hickman is being tipped for the top on the roads in 2016. In BSB, Hickman will team-mate James Ellison and Leon Haslam but will have no plans to be there making up the numbers. A BSB race winner at Cadwell Park, if Hickman can unlock the full potential of the new Kawasaki he will be in the fight for a Showdown spot. The record-breaking teenager's rookie Moto3 campaign was brought to a premature halt after suffering a fractured right ankle in a free practice crash at Misano but two podium finishes (Texas and Assen) along with two pole positions (Jerez and Le Mans) demonstrated Fabio Quartararo has the pace to challenge for the world championship. Storming up the ranks in the Spanish CEV championship, taking six titles in eight years, the French rider graduated to the world stage aged just 15 with a huge buzz (and pressure) surrounding him. Despite his anti-climactic end to 2015 - failing to score a single point in the final six races due to injury - Quartararo, who turns 17 in April, is being tipped as one of the Moto3 world title favourites having replaced champion Danny Kent at Leopard Racing. So long as the rider and team can make the seamless transition from Honda to KTM machinery, the youngster has the odds arguably in his favour. Petrucci pondering Aprilia, Redding still in play?